Starting wit version 2.5 FileBoss provides a toolbar listing all the active drives. But not only does it provide quick access to the root of the drive but also to the last twenty used folders on that drive. What is a used folder? A used folder is one in which you have spent some time - at least five seconds by default. This prevents the list of drive folders from being cluttered up with folders you just viewed briefly while on the way to the folder you wanted. Clicking one of the buttons representing a drive displays a drop down menu from which you can select either the root of the drive (the first entry) or a folder you have recently visited. If a folder is selected that no longer exits FileBoss will ask if you would like to remove that entry from the list of visited folders. FileBoss updates the drive bar dynamically as drives are added and removed (such as flash media and USB drives) so that the drive bar is always up to date. The drive bar is displayed and hidden just like any other toolbar. To do so right-click over any toolbar or empty space near a toolbar click on the name of the toolbar you want to turn off or on. 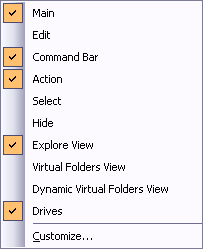 The toolbars can also be turned on and off using the Windows > Toolbars > item on the main menu. The Drive Bar can be move to any of the four sides of the FileBoss window or even made to float anywhere on the desktop. To do so click on the gripper to the left (or top if the toolbar is aligned vertically) and drag the Drive Bar to the desired location. If the Drive Bar is floating it can be quickly returned to its previous docked location (along one of the four sides of the main window) by double-clicking its title bar or dragging the title bar to that location.